A conic is the set of all points in a plane such that the distance of from a fixed point is in a constant ratio to the distance of from a fixed line which does not contain the fixed point. The fixed point is called the focus of a conic, and the fixed line is called the corresponding directrix. The plural of focus is foci, and the plural of directrix is directrices. The line through a focus of a conic perpendicular to its directrix is called the principal axis of the conic, and the points of intersection of the conic and its principal axis are called the vertices of the conic. The constant ratio in the above definition is called the eccentricity of the conic and is denoted by . 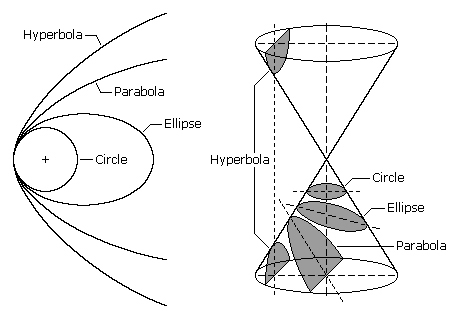 We shall see in the tutorials that a conic is a parabola if , an ellipse if and a hyperbola if .